2014 was the 32nd edition of the annual Pittsburgh Vintage Grand Prix. The Pittsburgh Vintage Grand Prix (PVGP) is the nation's largest vintage race event and a 10-day festival of car shows, races and motorsport activities. 'The Pittsburgh Vintage Grand Prix is all about keeping the history of cars alive while supporting two very important charities, Allegheny Valley School and the Autism Society of Pittsburgh,' said Dan DelBianco, Executive Director of the Pittsburgh Vintage Grand Prix. The story with the 2014 Pittsburgh Vintage Grand Prix presented by the Greater Pittsburgh Automobile Dealers Foundation began with the weather. The practice and qualifying session was a challenge, with rain throughout much of the day. The volunteers stepped up in grand fashion to redirect traffic, protect the golf course and get the show underway. The following day - the day of the race - had nearly perfect weather. Every year the Pittsburgh Vintage Grand Prix selects a car to be honored as the Marque of the Year. 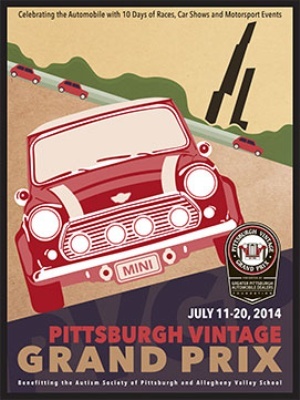 This year's Marque was Mini, and a special Mini race was held for Vintages up through 1972. The last time Mini was marque was back in 2003. Mini's of all years were featured throughout all ten days of the event. The car show at Schenley Park saw over 300 Mini owners and enthusiasts participating in the celebration of the Mini. Schenley Park is the scene of the PVGP and the 2.33 mile circuit has 23 turns and many treacherous obstacles such as manhole covers, phone poles and stone walls to avoid. The Grand Prix in Schenley Park is the only vintage race event that is run on actual city streets. • The Kick-Off Rallye started at a new location and there were 88 participants! A new record and a great day. • The Blacktie Gala at Longue Vue Club was simply amazing. Beautiful cars, wonderful people and perfect weather. Nearly $100,000 was raised for the charities. • The Historic Race Weekend at Pitt Race Complex in Beaver County saw some great racing action. Thousands of race fans came out to watch. • The car show on Walnut Street and the Waterfront were packed while the Tune-Up at Atria's exceeded all expectations. • The Gathering Field and Maddie Georgi put on a great show Thursday night at the Hard Rock. • The race weekend started off with rain on Saturday morning that continued throughout the day. The races continued while the car shows were delayed until 11:30. In the end it all worked out. Sunday was beautiful and the event concluded with thousands of happy race fans.